UPDATED: April 9, 2014, at 1:54 a.m.
Four months after his arrest for allegedly engineering a bomb hoax on Harvard’s campus, Quincy House sophomore Eldo Kim has still yet to be indicted by a grand jury. Allison D. Burroughs, Kim’s private counsel, declined to comment on the proceedings of the case, which began with a federal complaint on Dec. 17, 2013 alleging that Kim sent several emails saying he had placed bombs in two campus buildings. The U.S. Attorney’s Office did not respond to multiple requests for comment, and the case’s electronic court record has not changed since Dec. 23. The Speedy Trial Act of 1974 mandates that a suspect be indicted within 30 days of arrest. Yet, according to legal experts, a variety of pretrial delays can extend that timeframe, sometimes to a great extent. Alex Whiting, a professor of the practice of criminal prosecution at Harvard Law School, said that the defense and the U.S. Attorney’s office may be working to settle the case without a trial. However, Jeffrey A. Denner, founder of the Massachusetts firm J A Denner Criminal Defense Group, cautioned that the arrest was recent enough that no conclusion can be drawn from the delay. Denner also pointed out that the delay may be caused by the U.S. Attorney’s need to gather more evidence, rather than by negotiations. 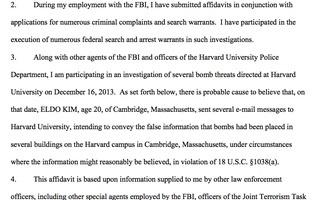 According to an affidavit filed by an FBI agent in December, Kim confessed to making the Dec. 16 bomb threat—which was sent to the Harvard University Police Department, University administrators, and the president of The Crimson—to avoid a final examination. “Normally, it’s not the defendant that’s slowing the indictment process down, it’s the U.S. Attorney’s office,” Denner said. Like Whiting, Kari E. Hong, an assistant professor at Boston College Law School and a criminal appeals attorney, said that she suspects the defendant’s counsel is in negotiation with the prosecution. If convicted under the federal bomb hoax statute, Kim could be sentenced to up to five years of imprisonment, three years of probationary release, and a $250,000 fine. Freshmen Leave for New Haven. Though it would be going too far to suggest that director Rebecca Richman Cohen HLS ’07 aestheticizes tragedy, one thing is immediately clear: CSPAN this is not. A judge has denied Brittany J. Smith’s motion to dismiss charges for her involvement in the May 2009 shooting in Kirkland House.